Moore’s talk, the inaugural presentation in the Damietta Center’s Distinguished Speaker Series, will take place at 6 p.m. Wednesday, Feb. 13, in the Damietta Center, Room 208 of the Reilly Center on campus. Moore will talk about the role Olean played in the Underground Railroad. She will also discuss the services offered by her center, which serves as a museum and education center, as well as a community, heritage and cultural center, celebrating the talents, lives and history of African Americans in the region. 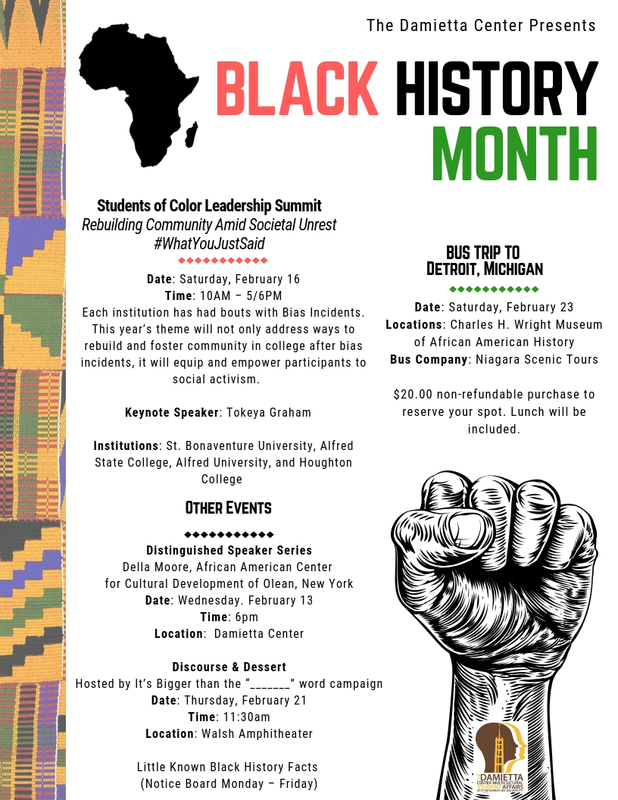 Feb 16 - Students of Color Leadership Summit. The event, titled “Rebuilding Community Amid Societal Unrest: #WhatYouJustSaid,” will take place from 10 a.m. to 5 p.m. in the Damietta Center. The summit’s keynote speaker is Tokeya C. Graham, an English professor at Monroe Community College, writer, and founder of Soulstainable Living, a movement that advocates a community-based lifestyle that encourages spiritual healing and continued education. Feb 21 - Other Black History events include “Discourse & Dessert,” hosted by the university’s “It’s Bigger than the ( ) Word” campaign. This event, to be held at 11:30 a.m. Thursday, Feb. 21, in the Walsh Science Center amphitheater, will feature a panel discussion on “The State of Black and Brown Relations at SBU.” University students, faculty and staff will participate.